ÁT needs your votes in the 2014 Better Together competition! Want to know more about all that we do at Áiseanna Tacaíochta (ÁT)? Take just two minutes out, and our entry to the 2014 Better Together video competition will tell you all you need to know! The Better Together Video Competition provides an opportunity for Irish non-profit organisations to submit short videos showing the part they are playing in making us all better together. Winners in the various categories can win prizes of €1,000 each, with voting remaining open until 21 November. 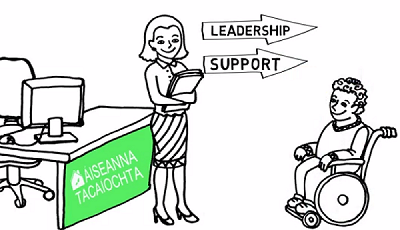 Our video takes you through ÁT’s role and objectives, outlining how we support people with disabilities in facilitating Direct Payments and working to secure true inclusion, equality and active citizenship for everyone. With just ten days to go, we are asking you to head over to the Better Together website and vote there for our entry. Every person can vote for their favourite video or organisation once a day while the poll is open, and we really appreciate all the support we get with this. Finally, we owe a huge thanks to Vica Szalai (director), Nora Ulrick (animation) and Grace Deegan (voice-over) for helping us to make this happen! To watch and vote for our 2014 Better Together Video Competition entry, please click here.